Published: Oct. 28, 2018 at 02:58 p.m. 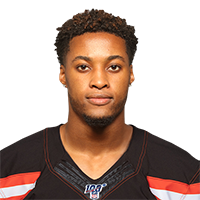 Published: Sept. 21, 2018 at 01:04 a.m.
Cleveland Browns rookie defensive back Denzel Ward grabs the ball out of New York Jets wide receiver Robby Anderson's hands after a catch thrown by New York Jets quarterback Sam Darnold. Published: Sept. 9, 2018 at 01:38 p.m.
Pittsburgh Steelers quarterback Ben Roethlisberger throws an interception down the center which is caught by Cleveland Browns defensive back Denzel Ward.